New signing Alex Baptiste will add some real experience to the Luton ranks during their battle for promotion this season, according to interim boss Mick Harford. The vastly experienced QPR defender, who turned 33 today, started his career at Mansfield, playing for Tamworth and Burton, before returning to the Stags, racking over 150 games. He went to Blackpool in July 2008, staying for five years, and played 22 times in the Premier League while at Bloomfield Road. Stints at Bolton, Blackburn, Sheffield United and Preston followed, before he moved to QPR in August 2017. 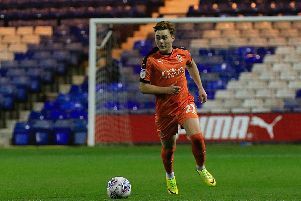 He has made seven appearances this season, before Luton snapped him up on loan ahead of a host of other clubs this evening, as Harford said: "He’s a great lad Alex, we’re absolutely thrilled to have Alex on board. "He’s a senior pro, he knows the rules, in the dressing room he will be massive for us in terms of trying to get us over the line in this promotion chase. "He’ll come in there, he’s a real, real good defender, experienced head, he knows the ropes and we’re just absolutely thrilled to get him, delighted,. "As there were lots of other clubs chasing Alex and we got ahead of a few of them. "I think he’ll be massive for us in terms of part of the dressing room and playing his part on the pitch. “Alex has played in the Premier League with Blackpool, he’s played under serious managers, he’s just a proper defender, a proper bloke. "You see him around the place already and he’s just something I believe we needed in terms of experience added to the squad, just to give that little bit of calmness and experience in the dressing room. "At times, we know it’s going to be a rollercoaster ride until the end of the season and he might just be a bit calming influence on a lot of players."